“I hope to motivate people not to be complacent and demand that they be represented,” D’Antuono told TheBlaze in a phone interview Wednesday, referencing a February poll that indicated 90 percent of Americans would support universal background checks. In the wake of Newtown, 45 senators disregarded the will of 90% of Americans who support universal background checks for gun buyers. They willingly put more innocent lives at risk just to ensure that their campaign contributions from the NRA keep coming. This is the most blatant and egregious example of special interests subverting our democracy with great sums of money. 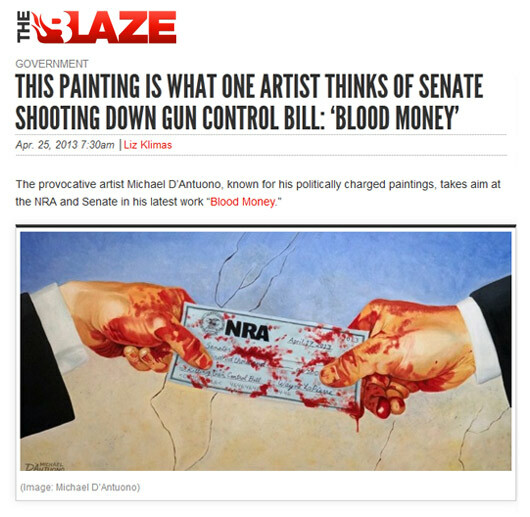 D’Antuono said he started the painting well before the Senate voted against gun control legislation last week, which included universal background checks and a ban on so-called “high-capacity” magazines. Michelangelo’s Creation of Adam, which depicts God reaching out a finger to Adam’s own outstretched hand, D’Antuono said is one of the most iconic symbols of humanity. D’Antuono’s painting will be on display Silent No More — March on The Lobbyists event in Washington on Thursday, April 25. This event, according to Washington Peace Center, is being organized by a coalition of progressive organizations, gun violence advocates and others naming lobbyists for the gun industry. “We will name them, shame them, and then march on to their K Street offices,” the event said.